Water heater failure signs are sometimes obvious. Other times, more subtle. Really, it depends on age, use, and overall condition. A failing water heater presents people with a real dilemma. It’s not exactly an inexpensive major appliance to replace and it usually requires an experienced plumber to install it. But, those aren’t the only problems. 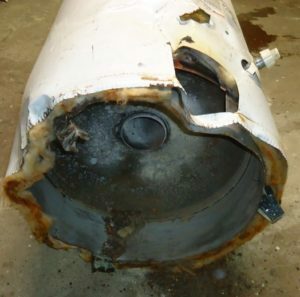 A bad water heater is problematic to dispose of, to say the least. Here’s why. All this to say, when a water heater does go bad, it’s your responsibility to dispose of it in a proper, legal manner. Now, this will take more time and effort but it comes with a trade-off of sorts. Meaning, you’ll get a new one to replace the old unit. Age. Start by finding the alphanumeric serial number on the unit. The first letter represents the month. Meanwhile, the two numbers after it represent the year. So, if there’s “D” to begin the serial number, followed by “06,” that means it was manufactured in December of 2006. Leaking water. Here’s something that’s not very subtle at all. Leaking water means trouble, at the very least. Puddling water is never a good sign when it comes to a water heater.